Dutch DJ/producers Isaac and F8trix come together to lock Hardstyle horns for this soundclash brought to you by Dimitri Vegas & Like Mike’s Smash The House imprint. Responsible for some big records of the past 12 months, Smash The House are kicking open the doors of 2014 with ‘Groupie Love’, which should set the tone for the year ahead! 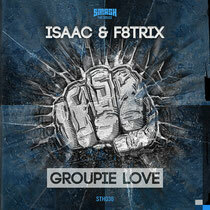 ‘Groupie Love’ has the typical Smash the House sound, sculpted for the dancefloor and should prove popular with fans of the sound and DJs alike. Big synths collide with percussion driving the energy to breaking point as an infectious vocal loops in-and-out. The track is geared for big events and will no doubt do pretty well for the label, check it out below. It’s out 17 February.